Robert Frost says ‘As near a paradise it can be’ while he describes the place in winter in his poem Winter Eden. One can very well imagine Belagavi/Belgaum in place of that paradise at this time of the year. Waking up to dry noses and finding your lips chapped and skin dry, you may very well exult …winter is here..Hurray! Temparature on Jan 3 had dropped to 9.4 Deg C.
Senior citizens reminisce of the days when mid – October heralded winter in Belagavi. But it’s January this year when the usual nip in the air is replaced by the chill. The outcome the roasted groundnut pushcarts and the crowds at the tea stalls thicken with every sip. Wardrobes are shuffled and sweaters, blankets, scarves, and woolens are pulled out once again. 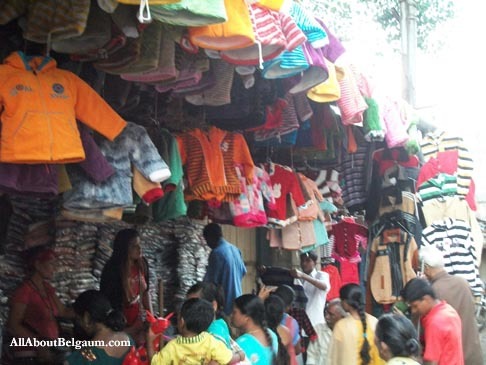 Families with tiny kids stretch their necks to check out the latest designs of sweaters hung up at the Tibetan’s stall on Kadolkar galli near Kaveri and Ramdev Galli. Kirloskar road attracts the youth with a flash sale of cheap pull-overs, sweatshirts and the stuff. The corporation’s cleaning staff bunch up the dried leaves and twigs and light up a small bon-fire while they chat besides in small whispers. For once, this pollution is neglected for the smell of burning leaves feels nice. Similar fires can be seen near rickshaw stands when the rickshawwalas in sweater-gloves-scarf , covered in multiple layers of shirts scamper to avoid the chill in the early hours of the morning and after 10 at night. It’s a sight to cherish when school kids walk merrily in bright red, navy or green sweaters that match their uniforms. Wake up to find droplets trickling from your parked car or bikes, a leftover of the fog of the dawn. The fog here is one phenomenon that drapes the city in an utterly romantic cover when even the mundane bullock cart becomes picture perfect and gets flashed in the newspapers because of the hazy background. On days when the chill worsens, one can even enjoy one’s own breath seen while you exhale. Many would remember pouting and breathing out the air in this chill to seem like smoking! The joy of witnessing your own breath is childishly magical. Housewives turn to warmer stuff made of jaggery, no one stops you from having an extra glass of sugarcane juice, warm badam milk is gulped down joyously and Hanuman sweet mart is thronged for that delicacy. It’s a habit to check the temperatures in the newspapers and exclaim “Oh! My God…it was 10 degrees yesterday!” (city this season has already seen a low of 11.4 Deg Celsius) Belagavi’s winter is a bane only to those who have to wake up early and set out for work or school/colleges. Pulling yourself out of the warmth of the quilts feels like hell and Sunday mornings start well beyond 10 am. facilitating a warm brunch instead of the routine stuff. But this very winter brings tears to those suffering from asthma and susceptible to a cough and cold. Whatever the price to pay, one waits in earnest anticipation for the mercury to dip and wish it lasts longer than the New Year! It’s only in Belagavi where you can experience the magic of a hill station. Do you think tibetan’s are the only ones who sell sweaters,winterwear. Actually Belgaum is also produces sweaters , visit kore galli, shahapur to my shop opposite Hajare kitchenware & look out for varieties.Once Belgaum was a largest sweater manufacturer.Support Belgaumites not outsiders, people think tibetan’s are manufacturers, but no. It gives me immense pressure to read the article presented. You deserve claps for portraying the smart city in a adorable way with the winter knocking the doorsteps. It gives me immense pleasure to read the article presented. You deserve claps for portraying the smart city in a adorable way with the winter knocking the doorsteps. Ah.. experienced the whole of winter season in this article. Very well written.